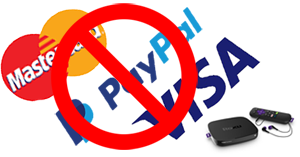 Are you frustrated or angry that Roku requires you to enter a credit card or PayPal payment information to open an account? Are you afraid that Roku is going to charge you to register your device? Maybe you're afraid that Roku's systems will be hacked and your information will be stolen. If any of these apply to you, there's good news - Roku has an unpublicized "no credit credit" link available. Just go to https://my.roku.com/signup/nocc and you can create a free account and register your Roku device or Roku TV without entering any payment information. So, why does Roku ask for payment information anyway? There is never any fee to create a Roku account or to register a Roku device. (More on that later.) 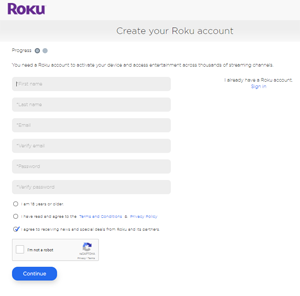 Roku asks for payment information to make it easier for users to purchase or subscribe to channels directly from their Roku device. Roku takes a cut of the payment when you're billed through your Roku account, so Roku, Inc. also has a financial incentive to get your payment information. At some point, though, you may decide that you want to sign up for a fee-based channel through your Roku. If that happens, you'll need to log into your Roku account at my.roku.com, click the "update" button under the payment method heading, and enter credit card or PayPal account information there. TIP: When you enter payment information, make sure you add a PIN and selection the option to "always require a PIN to make purchases." This will keep you from accidentally adding a fee-based channel, and will prevent your kids or other housemates making purchases on your account. With the PIN set to this option, you can still add free channels, but if you try to add a channel with a fee, you will be prompted to enter the PIN before you're charged. One more thing - as I said above, Roku does not charge to create an account or to register a Roku device. I've received a number of emails from irate Roku customers who said that they called a toll-free number and were told that they had to pay a fee of up to $100 to register their device or to get technical support for setting up the device. Be aware that there are many fraudulent websites claiming to be the place to go to register your Roku device or to get technical support. Roku clearly states on their own website that "Roku does not charge an activation fee or charge for support." For more information, Roku has information on their support site at this link.